A 41-year-old woman, who was arrested by policemen attached to Area ‘J’ Command, Ajah, Lagos State, for allegedly hiring assassins to kill her husband of 14 years over a disagreement which led to their separation, has said she was a frustrated housewife but that she only sent the thugs to beat him. 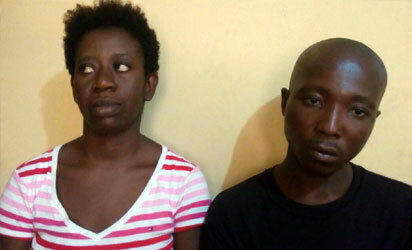 The suspect, Mrs. Chika Orji, was arrested following a confessional statement by one of the suspected assassins, Bright Ikechukwu, who was arrested while attempting to break into Mr. Orji’s apartment at Jakande Estate, Ajah. During preliminary investigation, it was discovered that one of those hired for the botched assassination was a carpenter, identified as Ekene, who usually worked for Mr. Orji. During interrogation, Mrs Orji, a mother of four, denied sending thugs to kill her husband. Rather, she stated that she only told them to beat him, to teach him a lesson for always beating her. “we got married 14 years ago and are blessed with three daughters and a son. All of a sudden, my husband became a wife beater. He would beat me, leaving me with swollen face and would also threaten to kill me. “He chased me out of the house three years ago. I made several efforts to get my children back, part of which was to report him to human rights offices for settlement. But he did not honour any of the invitations. Both families have made attempts to settle us, but he would not listen. “He was served with a court warrant over the issue, but he also refused to show up. Along the line, he sold the house we both built for N85 million, but never gave me any dime. But on that day, it was his daughter that opened the gate. We went back the next day, yet it was his daughter that opened the gate again. “By the time we went the third day, it was Mr Orji that opened the gate himself. The plan was to rush to him and stab him eight times in the chest, rib and neck. But Samuel, who was supposed to stab him, went to buy cigarette and by the time he came back, our target had gone inside and shut the gate. “Out of frustration, I went back home and told Ekene to give me my own share of the money that I was going home.